A complete industrial steam ironing unit made for: Design Rooms, tailors workshops, ironing services, wardrobe departments, pressing rooms, alteration shops & clothing manufacturers etc. The Pressing station is designed as a compact industrial ironing unit with features similar to those of much bigger tables & generators. It should not be confused with domestic or semi-industrial units, as only industrial components are used throughout our entire range. It is aimed at users who require professional finished results from compact equipment, which is easy to set-up & use. It requires no special installation, uses standard tap water & is powered by 2 standard 13 amp plugs. Strong industrial metal box frame construction. Built-in powerful industrial vacuum motor (as used in the bigger vacuum tables) to quickly draw steam through the garment + dry & fix at the same time. Pressing surface with built-in heating element & led indicator, to help reduce pressing dampness. Central foot pedal to operate vacuum motor leaving both hands free. High temperature iron rest with hose support. Upgrade port & upgrade electrical socket fitted as standard, so you can add sleeve arms etc. Fully enclosed compact metal construction, based on the larger boilers. 5 litre stainless steel heating chamber. Service/Element port, with the element mounted inside the boiler. Built-in illuminated water level gauge. Top mounted manual filler cap: for adding standard tap water. Blow down / service drain tap. normally only found on much larger generators. 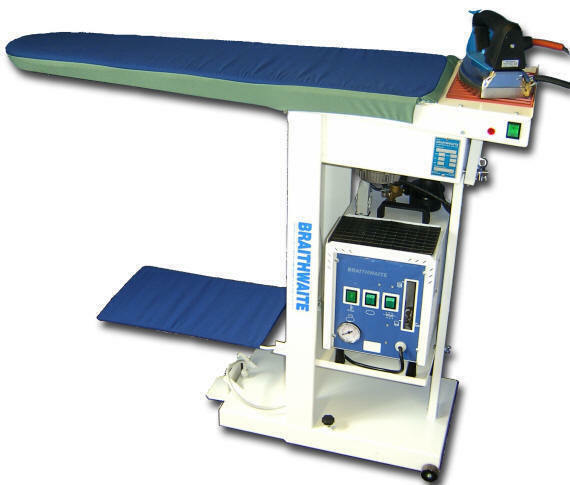 The Braithwaite pressing station can be viewed & demonstrated at our Salford / Manchester Warehouse.